Marek Radomski, vice-dean of research in the College of Medicine. From Poland to London to Spain to Alberta to Texas to Ireland, Dr. Marek Radomski has followed his curiosity around the world. And that same curiosity, in combination with the lure of a challenge, has brought Radomski to the U of S College of Medicine as the vice-dean of research, a position he started March 14, 2016. 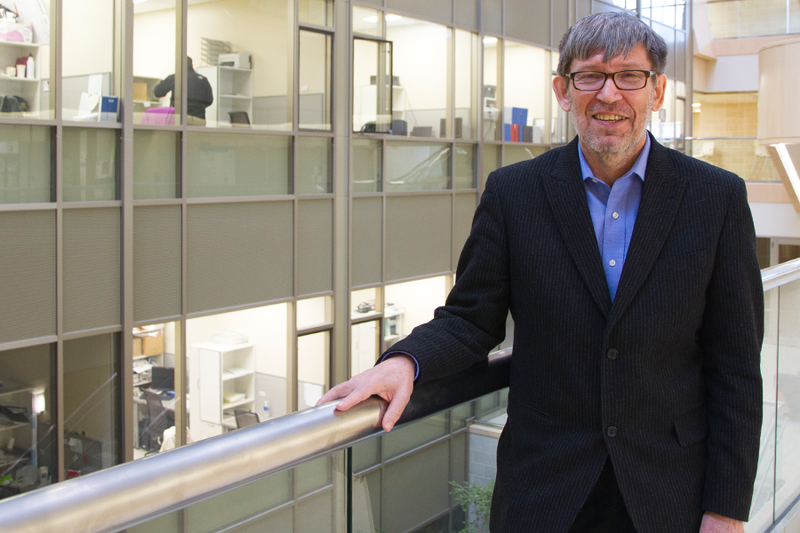 "My path has always been about taking on challenges, and I always believed you could be a top researcher no matter where you were," said Radomski, who most recently was chair of pharmacology at Trinity College at the University of Dublin. Radomski—while intrigued by the facilities, like the Canadian Light Source, VIDO-InterVac and the Health Sciences building, and impressed by the people at the U of S—said what piqued his interest most was the challenge presented by the position's key responsibility: giving research productivity in the College of Medicine a shot in the arm. "In CIHR funding, the college only had only two or three awards last year," he said, adding that this ongoing under-performance has been a concern for a number of years. "This is a very big challenge for reasons that are complex," said Radomski. "Research productivity has been flat for a number of years while other medical schools have been growing. This has created a gap that is concerning for senior administration." In addressing this issue, Radomski plans to approach the college's research agenda like he would a patient: listen, review, diagnose and then prescribe. "I'm in the discussion phase right now; meeting with everyone from faculty and researchers, to medical students and post-docs. I am trying to understand what they are doing and what challenges they face." The next step, he continued, will be to undertake an external review that will examine strengths, weaknesses, opportunities and threats. "We will get a report that will highlight where we are, where we need to go and what needs to be rectified." Radomski is clear that while he intends to stick to the "review, understand and prescribe" process, in certain cases he must "prescribe before diagnosis of symptoms." As an example, he said he intends to spearhead a research agenda focused on Aboriginal medicine, citing a demographic shift that may see 50 per cent of Saskatchewan's population being of Aboriginal ancestry by 2050. "With every second citizen being of Aboriginal descent, the subject of Aboriginal well-being is important to everyone in the province. The College of Medicine needs to help as much as we can. Whenever possible we should be of value as much as possible to the people in the province." Another area in which he intends to prescribe before diagnosing is in supporting researchers who are early in their careers. "A strong focus should go towards early career researchers and providing the mentorship and support to help them succeed in funding competitions," he explained. "In my experience, early career researchers can be very productive if mentored, but obstacles make it difficult to be productive. Success early in your career can turn into bigger research money later." Radomski, with more than 250 publications to his name in the pharmacology field, an h-index of 61, and a mentor to countless students, is no stranger to highly productive research and knows full well what it takes to set up a successful research program. But with that knowledge, he knew he could not divide his attention between being the vice-dean and being a successful researcher. "I agonized over the decision but I knew my effort needs to be entirely devoted to administrating, facilitating and spear-heading research. But I understand what makes a successful researcher or research program and I can share that. "Using my experience, expertise and enthusiasm, as much as I can, I really want to make a difference and I hope I can. I have a five-year mandate and that's a good amount of time."